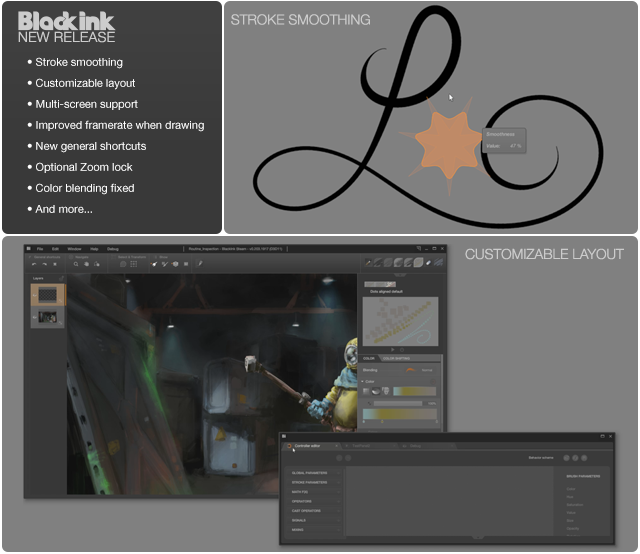 The Controller Editor can now be dragged out of Black Ink’s main window. More panels will have this behavior in future versions. This feature shows the new Stacking capacity for such windows in Black Ink. However, some controls/editors are fixed to their place to keep a consistent UI. In the transform tool, after clicking a command button (like “flip horizontally”) the focus is not tied to this button anymore, so that pressing Enter validates the current transform. An option have been added in the Zoom tool to enable/disable zooming at more than 100%. When using the Save command on a document which isn’t a BKD, the program automatically transforms the command into a Save As. Sometimes when doing Ctrl+A, Ctrl+C, Ctrl+V on big images, the copied content isn’t polluted with some invalids squares anymore. With multiple monitor, the Black Ink Window is moved to another monitor when activating the application. I like the features of the new update - Multimonitor - support is a great extension. I am so exited for the upcoming versions of Black Inc. In my opinion, Black Inc can get one of the best digital painting software around. Keep up your awesome work.